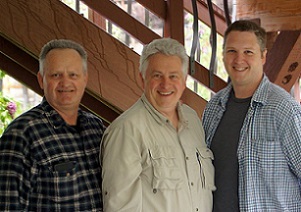 St Louise Cut Ribs. For special occasions when I am not cooking for so many people I like to get ribs from the local butcher which have higher quality meats and meatier ribs. 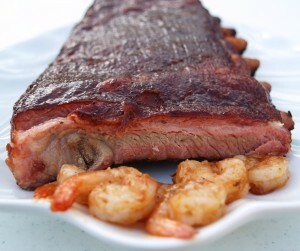 Remove the membrane (next to the rib bones on the back side) by using a knife and paper towel to pull it off. 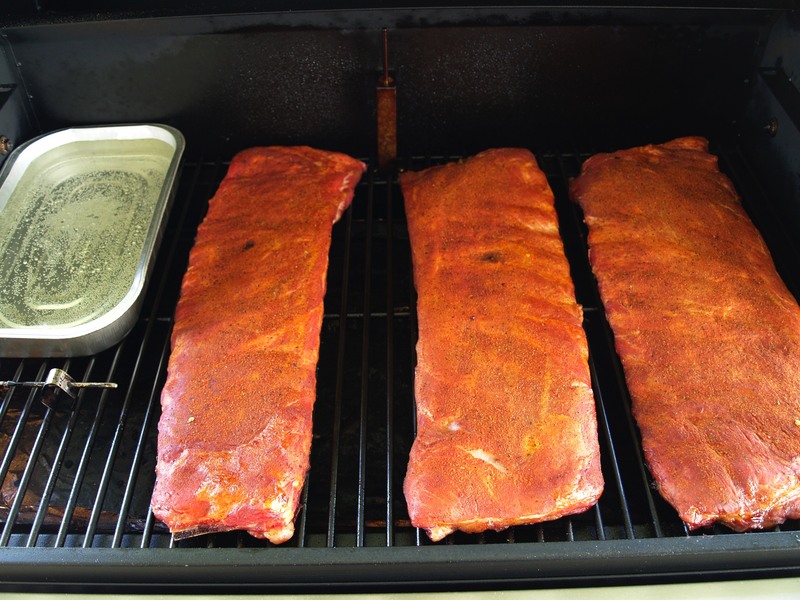 Place the ribs on a cooking sheet and spread a light coating of mustard over both side of the ribs. Spread an even coating of rub over both side of ribs. Hold the bootle of rub 6 – 8 inches above the meat when applying the rub. 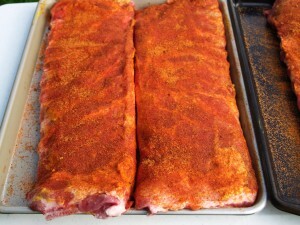 Place saran wrap over the ribs and place in the refrigerator for 4-6 hours. Place a pan of water on top of the grill to keep the air moist so that it does not dry out the ribs. Place the ribs on the grill meat side up and smoke the ribs for 3 hours. 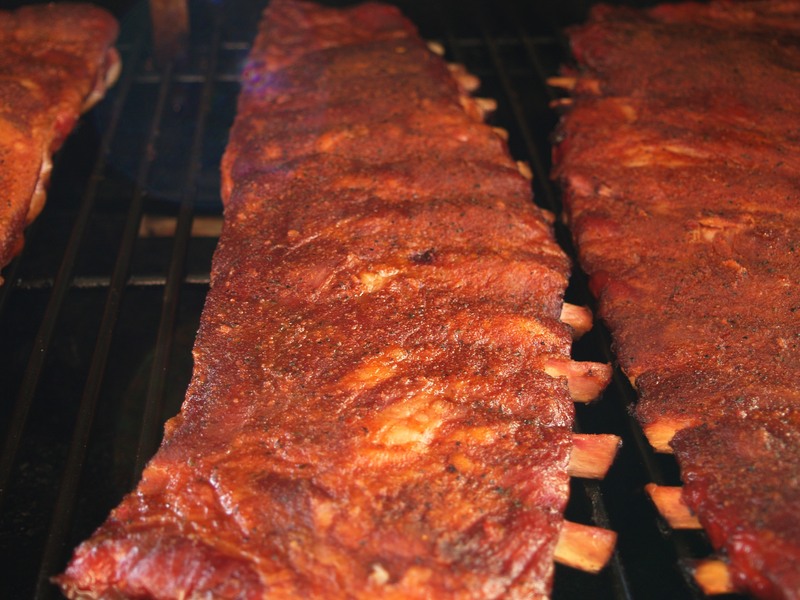 Every hour spray the ribs with water, vinegar or apple juice which will help the meat absorb the smoke particles that make the ribs taste so good. 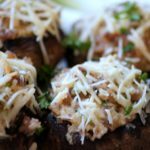 Now is the time to relax and enjoy the time while the meat cooks. Read a book, do some yard work that you have been putting off or take a nap. 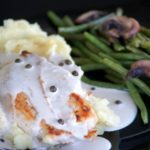 Place a sheet of heavy duty aluminum foil on a cooking sheet and fold up the edges a bit. Spray cooking spray on the aluminum foil. 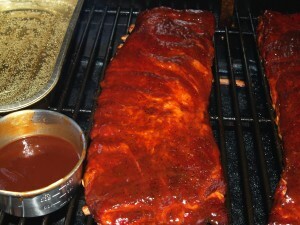 Place a rack of ribs meat side down in the aluminum foil and pour some apple juice on the ribs. 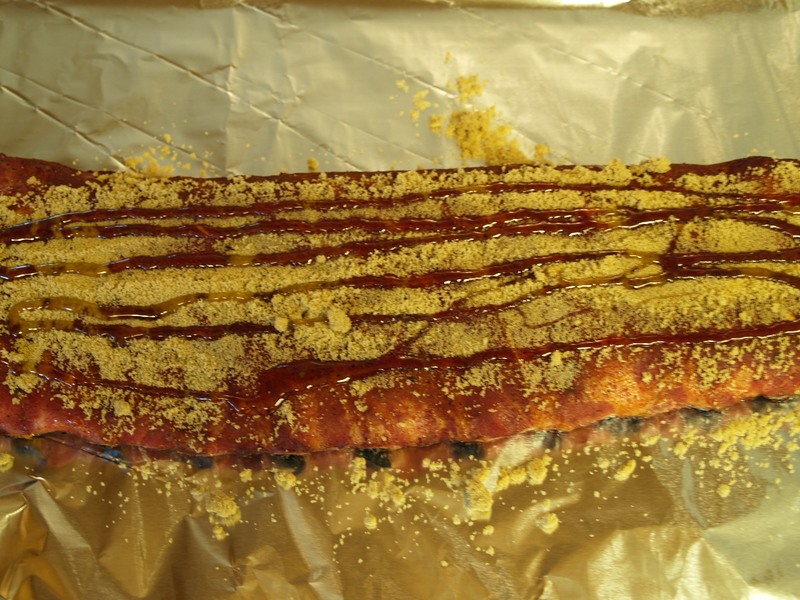 Spread the 1/4 of brown sugar on the ribs and the drizzle some honey on them. 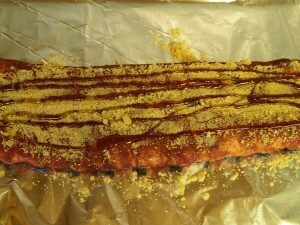 Wrap the ribs in the foil and create a tight seal with the foil tightly being careful not puncture the foil. This will create a semi-pressure cooker to help break down the collagen and make the meat tender and moist. 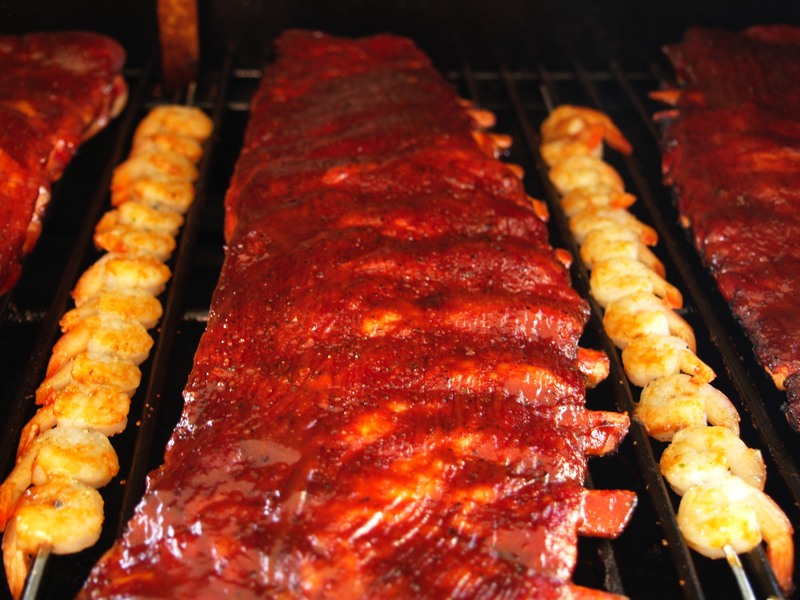 Place the wrapped ribs back on the grill carefully and cook for another 2 hours. 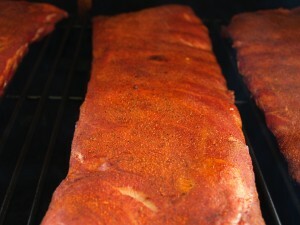 After 2 hours the ribs should be flexible and the bones starting to pull away from the meat. 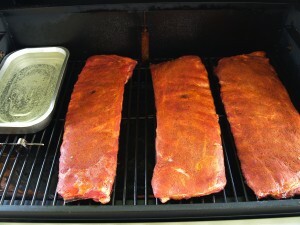 Take the ribs out of the foil and place them back on the grill meat side up. 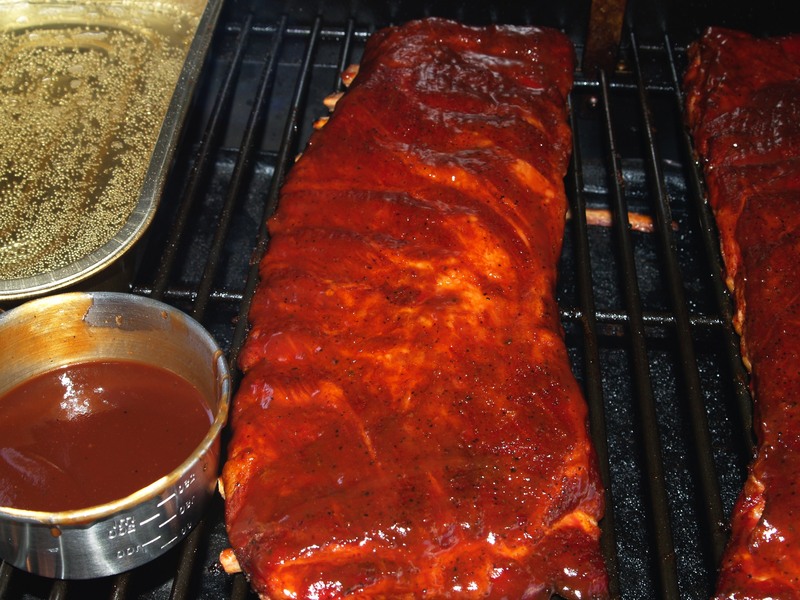 Place some BBQ sauce in a metal bowl and add a little water to thin it out and place the bowl on grill besides ribs. Mop the BBQ sauce on several times during the next 1/2 to 1 hours to finish cooking the ribs. My wanted some shrimp with her ribs and since it was mother’s day I made up a couple of skewers of small shrimp that we had and coated them garlic powder, seasoning salt and some BBQ sauce and place them on the grill the last couple minutes of the cook. What the ribs look like after taking them out of the foil.